Tons of gameplay for a low price. 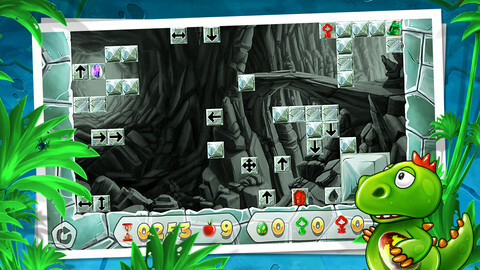 Dino Rocks is a very challenging puzzle game that uses the very simple mechanic of moving a cute little dinosaur through a series of caves to confound and confuse players more often than not. As the levels become ever more convoluted and complicated, this is one game you’ll need your thinking cap to get through. For gamers looking for an aesthetically pleasing puzzle game that won’t leave them wanting for a challenge, look no further. Dino Rocks is the latest in long line of puzzle game to hit the mobile platform lately. To stand out amongst the crowd of games available in this genre, developers have to really come up with something special to catch gamers’ attention. 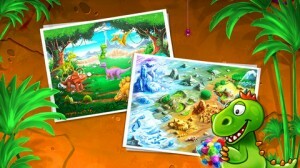 Dino Rocks from Sungift Games seeks to be your next new obsession, but can it really hold your attention for more than just a few levels? The premise behind Dino Rocks is a simple one. 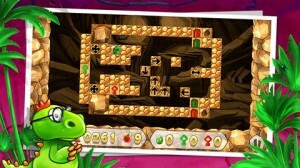 You play as an incredibly adorable little dinosaur who has been trapped in a series of caves by a falling meteorite. In order to get the little guy back to the surface, you need to help him navigate levels full of falling floors, moving tiles, locked doors, dinosaur eggs and more. All of this while your every move is counted in the quest for that ever elusive high score. Since Dino Rocks is a mobile game, it shouldn’t suprise you that you will be using touch controls – but they are the very basic of touch controls, really, as it is your brain rather than your nimble fingers that will allow you to advance in this game. The levels feel almost like a maze, in a way. 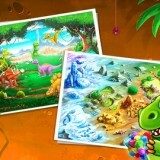 Each tile on the floor is one move (simply tap the tile next to your dinosaur and he’ll move onto it.) The first levels are fairly easy, and you navigate quickly from your spot to the whole in the floor that serves as your way out. 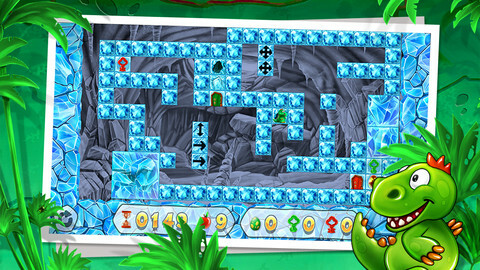 But soon more and more types of tiles will be added to the mix, and it is then that your gameplay gets challenging. Some tiles can only be walked on once, leaving you stranded without a way back (unfortunately, your dinosaur doesn’t have the legs for jumping). Some tiles can move across open spaces, but many of these can only move in one direction, meaning that once you move it, it can’t go back. There are doors that need keys to be collected before they will open. And there are many, many times where you will need to move a number of tiles in exactly the right order or you will not advance. It can be very frustrating at times, but Dino Rocks is a game that really makes you think (and most people aren’t buying a puzzle game for the pretty tiles, so that’s a plus in this case). Fortunately, you can try and retry the levels in Dino Rocks as many times as you need to reach a solution, and you can reset a level at any time, when you feel like you’ve made a wrong turn somewhere. There aren’t any sorts of hints or anything – you need to figure things out for yourself – so I do think people who are easily frustrated may find themselves stuck and simply abandon the game. However, for those who like a good challenge, Dino Rocks offers literally a hundred of pre-made levels for you to work your way through, and that is a lot of gaming time for a pretty low price. In addition to the game’s original levels, there is also a creator mode where you can make as many of your own levels as your little heart desires, making Dino Rocks a game that has infinite replay value for gamers who enjoy these types of puzzles.